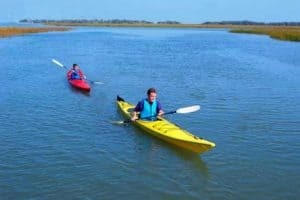 Book your tour with our experienced guides to give you a safe and memorable day seeing Daufuskie Island from the most unique and natural perspective… the water! There is no doubt that this will be a highlight of your vacation you will not soon forget. In addition to possibly getting up close to Daufuskie wildlife such as dolphin, egrets, great blue herons, eagles, osprey, and much more, our guides with naturalist backgrounds will give you low country knowledge of the many wonders you are sure to see, smell, and touch. We also offer kayak and paddleboard rentals for those of you who may want a self-guided outing. Tours run seasonally. Booking less than 24 hours in advance? Please call us at 843-842-9449 to book!